on April 2, 2019, 4:11 p.m. 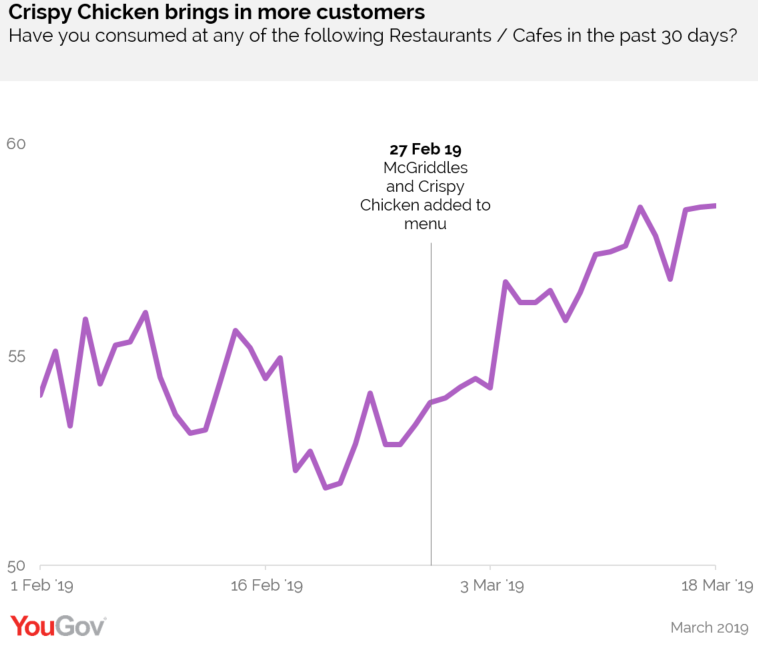 The introduction of a limited edition menu at McDonald’s has been a hit with Singaporeans and has improved the public’s perception of the brand, new analysis from YouGov Plan & Track shows. The fast food chain announced the introduction of two items to its menu – the McGriddles and Crispy Chicken – on 27 February. It enticed fans with a teaser launch two-days before, limiting the sale of the McGriddles to 100 customers only, and also sold exclusive merchandise. Although they were only on sale for a limited time, the addition of the savoury sandwich to the menu satisfied many consumers. 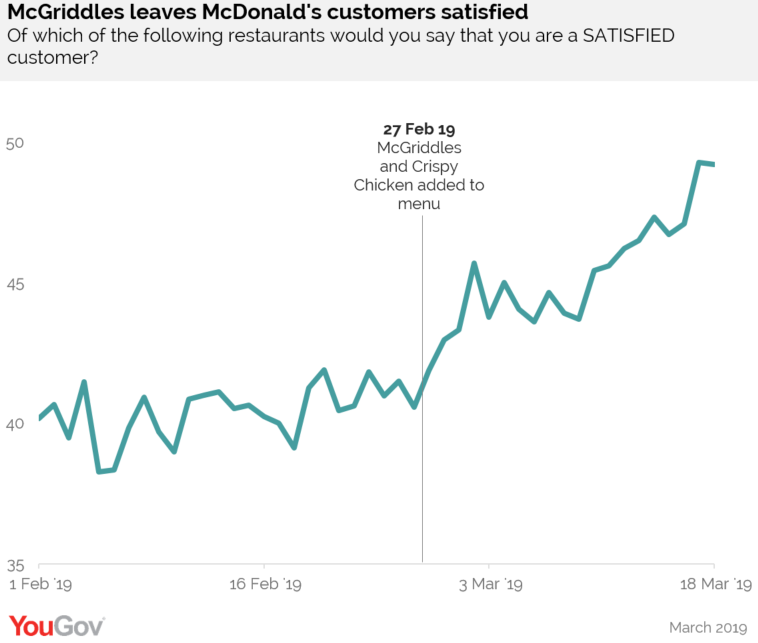 McDonald’s Satisfaction score, which measures whether people were satisfied customers of a brand, rose from a 41.9 on the day of the announcement to 49.2 on 17 March, a jump of +7.3 points in three weeks. Alongside the McGriddles, McDonald’s also introduced Crispy Chicken for a limited time only. The introduction of the limited edition fried chicken followed an increase of customers at McDonald’s. On the day of the announcement, McDonald’s Current Customer score was at 53.9. Today it sits at 58.5, indicating an increase of +4.6 points. Other metrics have also performed well since the new editions to the menu. The brand’s Buzz score (which measures whether people have heard anything positive or negative about the brand over the past two weeks) have risen from 21.5 to 33.1 (an increase of +11.6 points). McDonald’s Recommend score (which measure how many people would recommend the brand) also rose from 23.5 to 32.7, indicating a rise of 9.2 points.